Healthy eating is heavily reliant upon how much fiber you get each day. The word ‘fiber” has come up time and again in the past few decades, and the “high-fiber” labels on products all over the supermarket attest to the fact that most consumers know of its great importance. Here’s something else to know: researchers just found that a high-fiber diet will protect you from heart disease over the course of your life. Out of Chicago, the study shows how critical fiber is for adults. It focused on people between 20 and 59, finding that those with the highest fiber intake had a significantly lower estimated lifetime risk for heart disease. The study was presented very recently at the American Heart Association’s Nutrition, Physical Activity and Metabolism/ Cardiovascular Disease Epidemiology and Prevention Scientific Sessions in Atlanta. It is the first known study to show how fiber influences your lifetime risk for cardiovascular disease. What we have known is that fiber helps you shed pounds, lower cholesterol, and improve blood pressure readings. That in turn makes sense for the new study, as all three are risk factors for heart disease. 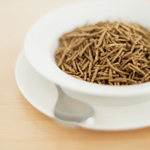 The American Heart Association recommends 25 grams of dietary fiber or more a day. The best place to get such high levels of fiber is through whole foods. The new study looked at data from the National Health and Nutrition Examination Survey, a sample of about 11,000 adults. They considered diet, blood pressure, total cholesterol, smoking status, and history of diabetes in survey participants, and then used a formula to predict lifetime risk for heart disease. The “amazing” results found that younger adults and middle-aged adults with the highest fiber intake have a lower lifetime risk for cardiovascular disease. That did not hold true for those aged 60 to 79, possibly because the majority of adults have built up higher levels of risk factors for heart disease by that point. But it is never, obviously, too late to get the fiber you need to stay disease-free. To do so, it is far better to find fiber naturally in foods rather than supplementing your diet with high fiber bars.